Davidson’s men’s basketball team has won accolades this year for defying expectations on the court, finishing in first place in their inaugural season in the Atlantic 10 after being picked 12th, out of 14 teams, in the preseason poll. The Wildcats run an efficient, aesthetically pleasing offense, a welcome contrast to an otherwise rough college basketball season, where scoring was near all-time lows. Basketball success is not new to the 1,850 student liberal arts college in North Carolina: Golden State Warriors star Stephen Curry is a former Wildcat. Nor is academic achievement: Woodrow Wilson is another prominent alum. Now, the two have come together: Davidson is the academic champion of the 2015 NCAA tournament. According to new rankings generated by the New America, a non-partisan Washington, D.C. think tank, for all 68 teams in the tournament–and shared exclusively with TIME — Davidson cuts down the proverbial nets. Here’s how: we matched teams up in the classroom, using the tournament brackets to determine the games. 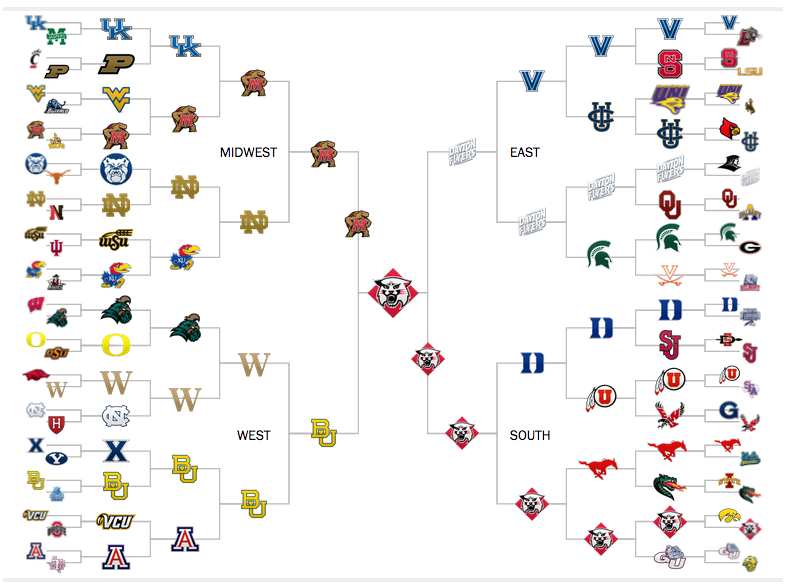 If the on-court bracket results mimicked academic performance, the Final Four would look like this: Davidson wins the South, Maryland comes out of the Midwest, Baylor takes the West and Dayton wins the East. Davidson knocks off Baylor in one national semifinal. Maryland knocks off Dayton in the other semi, with Davidson taking the title game. The full bracket is below. The formula for New America’s March Madness mimics that of its College Football Playoff rankings released in December (TCU won that title). The base measure is a school’s most recent men’s basketball “Graduation Success Rate,” a figure measured by the NCAA that doesn’t dock schools for having players who transfer or go pro before graduating–as long as those players leave in good academic standing. The higher the school’s graduation success rate, the higher they start out in New America’s rankings. New America, however, did subtract points from schools that graduate men’s basketball players at a much different rate than the overall men’s graduation rate at the school. To compare students to athletes, New America used federal graduation rates, which take a cohort of students from 2004-2007, and measured if they graduated within six years. Even if a school graduated basketball players at higher rates than the overall male student population, the difference was counted as a penalty against schools that have low overall male graduation rates. One important note: Harvard, the Ivy League champion, was excluded from the rankings because the Ivy League does not report federal graduation rates for athletes. So the University of North Carolina, Harvard’s first round opponent, moves on. Harvard was one of 13 schools, including Davidson, Maryland, Notre Dame, Butler and Dayton, that reported a perfect graduation success rate for basketball players. Indiana was the easiest out, finishing last in New America’s rankings. Hoosier basketball players graduated at an 8% federal rate, according to the most recent numbers, fare below the overall male student graduation rate of 72%. That discrepancy killed their score. Indiana basketball spokesman J.D. Campbell points out that current coach Tom Crean was hired in April 2008, after the 2004-2007 cohort captured by the federal rate enrolled in the school. Indiana’s men’s basketball team does have a perfect Academic Progress Rate, an NCAA metric that measures the academic eligibility of current players, and Campbell says that every Crean recruit that hasn’t transferred or left early for the NBA has graduated (one of Indiana’s three early entries to the NBA, Victor Oladipo of the Orlando Magic, graduated in three years). To see how the whole field stacks up, check out these rankings.